Discussion in 'Misc.' started by ad-team, Jun 13, 2018. This 2nd edition of the Handbook explores how to conceptualize new realities of race and ethnic relations. Now that the decade of the 1960s, the pivotal moment of mobilization against racism, racial discrimination, xenophobia and related tolerance is behind us, we are witnessing the intensification of racial and ethnic inequality, an increasing frequency of racial and ethnic conflict and violence, but also the sound of powerful voices of struggle against it. This volume examines contemporary issues and critical discussions regarding race and ethnic relations in the United States as well as globally. 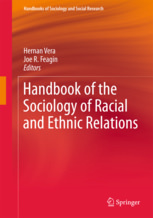 Case studies and comparative approaches examine the foundations of a comprehensive sociological theory of race and ethnic relations, such as connections between everyday interactions, as well as patterns of discrimination and segregation, and theoretical positions to activism. Chapters are updated reflecting contemporary issues and theoretical developments in the field. Includes new chapters focusing on topics such as global racism, environmental racism, criminalization, militairy, health and queer theory. This revised volume provides an updated solid reference book for those interested in race and ethnic studies.